BARBER MOTORSPORTS PARK, ALABAMA – Touting #DriveAnything, Parker Thompson got behind the wheel of the #3 JDX Racing – Hertz – Byers Porsche GT3 Cup Car this weekend for his first experience in fender-to-fender racing action at the 2019 IMSA Porsche GT3 Cup Challenge USA season opener. As an experienced open-wheel race car driver, Thompson’s debut in the series generated significant intrigue about his potential in sports car racing. The final results did not disappoint. 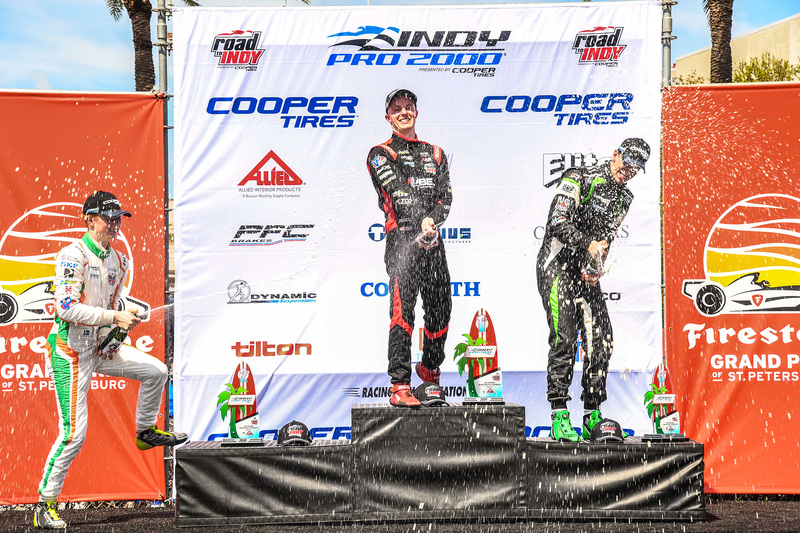 At the conclusion of each race, Thompson found himself celebrating on the podium. Third-place finishes in both race one and race two, position him 3rd overall in the GT3 Cup Challenge USA Championship standings. Both races saw hard battles and close quarter racing that is characteristic of the Porsche GT3 Cup Challenge, but race two was particularly close. Thompson’s #3 car took damage on lap four, destroying the front splitter and significantly challenging his pace from that point forward. As a result, Thompson found himself on the defense against sophomore drivers Maxwell Root, and JDX Racing teammate, Jeff Kingsley. Root showed tremendous pressure, often going side-by-side with Thompson on the winding road course, but he never managed to execute a full pass. Root would eventually collide with lapped traffic, leaving Thompson to defend Kingsley alone. The battle between the two young Canadians lasted right to the checkered flag, with Thompson managing to hold his spot and earn the final podium position. 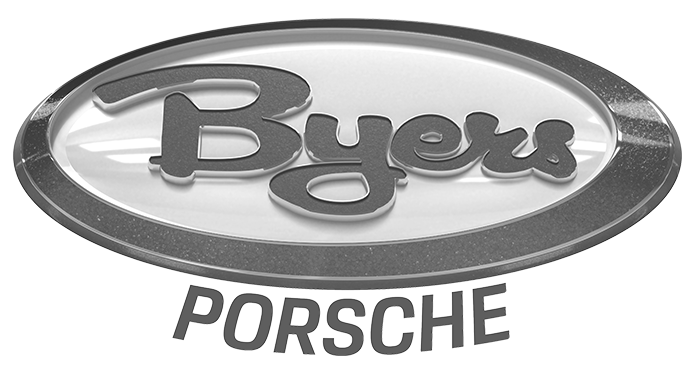 LOVELAND, CO. – JDX Racing is excited to announce the signing of Open Wheel Standout Parker Thompson to drive the #3 JDX/Hertz/Byers Porsche in the IMSA GT3 Cup Challenge USA by Yokohama beginning this weekend at Barber Motorsports Park. Parker, a 21 year-old from Red Deer, Alberta, Canada, began racing go-karts at the age of 8, quickly establishing himself as a racer who grabbed the attention of the entire karting community. At age 13, he was ranked 3rd in the world in Rotax Max karts. Entering open-wheel racing in 2015, Parker competed in the US F2000 series, claiming eleven Top-10 finishes in 16 starts. He would continue to craft his racing skills the next two seasons, capturing 25, Top-5 finishes in 30 starts. 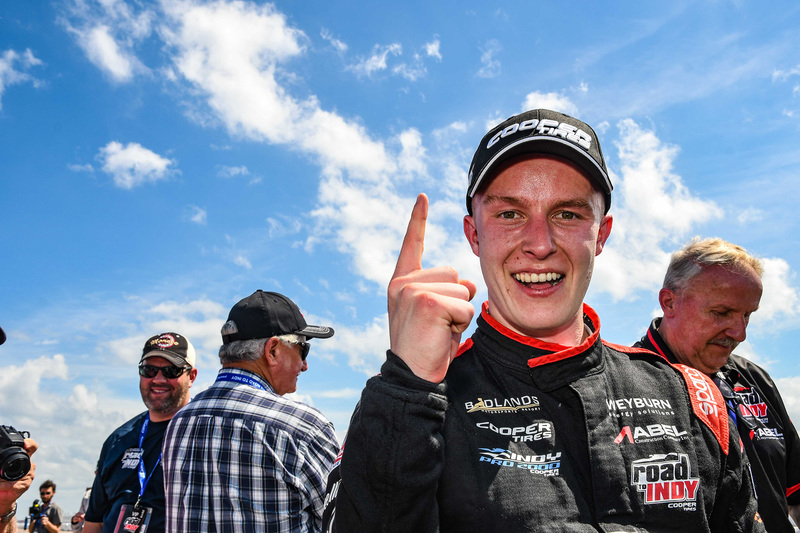 Following his dominating performance in the 2017 Canadian F1600 Super Series Championship Parker moved to The Road to Indy in 2018 where he managed to finish second in the overall Championship. Having twice finished second in the season championship, he’s more determined than ever to claim an overall Championship title. Founded in 2008 and based outside of Denver, CO, JDX Racing represents the very best in professional motorsports. Competing in the IMSA sports car series, JDX Racing campaigns cars in eight events throughout North America. JDX Racing features world-class drivers, outstanding crew members and dynamic marketers from Champ Car, IndyCar, NASCAR, ALMS and the Champ Car Atlantic Championship series. For more information, follow JDX Racing on Facebook, on Twitter and on Instagram. 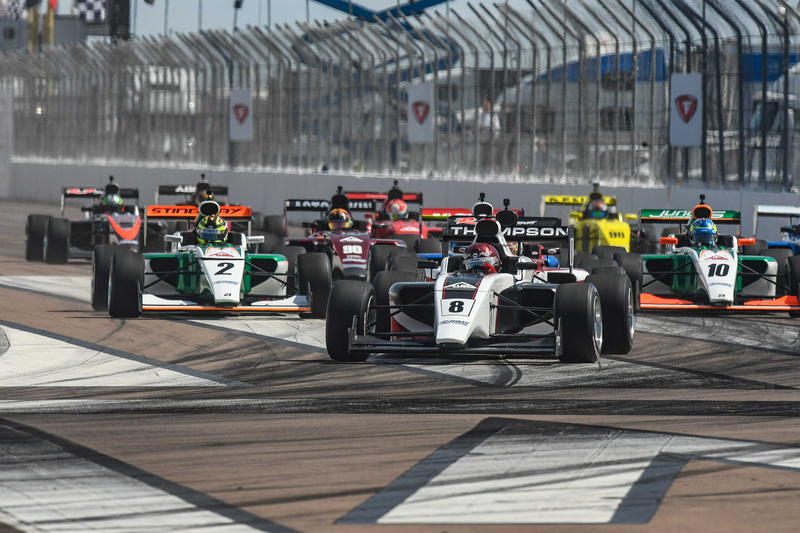 ST. PETERSBURG, FLORIDA – The 2019 NTT IndyCar season began this weekend in St. Petersburg, Florida, and Alberta native Parker Thompson was there to race in the Indy Pro 2000 category. A feeder series for the top-level IndyCar championship, Indy Pro 2000 is contested by young professional racers from all over the globe. Parker Thompson dominated the weekend. The Red Deer, Alberta native qualified on pole position for both Indy Pro 2000 races, set a new track record, and converted his starts from the lead position into victories for both races. With that he has established a big lead in the championship standings with Sweden’s Rasmus Lindh, and Singapore’s Danial Frost in second and third positions behind him. Twenty-one-year-old Thompson is an established racer who has had the attention of the racing community since childhood. At age thirteen, he was ranked 3rdon the globe in Rotax Max karts. 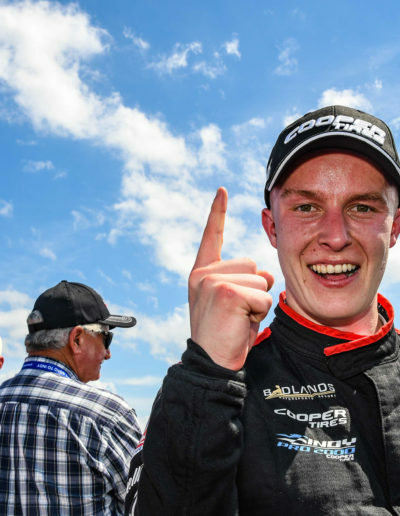 2017 saw him dominate the Canadian F1600 Super Series Championship. The Road to Indy has been Thompson’s most recent conquest. Having twice finished second in the season championship, he is still seeking an overall title win. Double victories in St. Petersburg indicate that 2019 could be Thompson’s best season yet. Uncertainties off the track though, mean that his focus is not solely on driving. 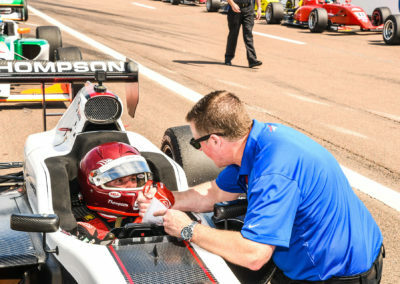 In St. Petersburg, Thompson joined Kentucky based Abel Motorsports as their team took on the Indy Pro 2000 series for the first time. 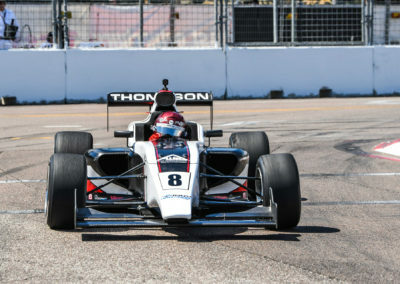 Thompson did so with a single-race contract which leaned on his experience in the series to help the Abel Motorsports team, and young lead driver Jacob Abel, adapt their experience in other series, to Indy Pro 2000. The partnership worked. Twin pole positions, twin victories, and a new track record mark a monumental achievement for a rookie team in the series. With such a strong performance, Thompson demonstrated that his skill and understanding of the car and series are second to none. A full season commitment, however, will require extended sponsorship support. With the next event in the Indy Pro 2000 Championship occurring May 9th to 11th in Indianapolis, Indiana, Thompson has nearly two months to solidify the partnerships that will allow him to continue his pursuit of a championship title in 2019, and set the stage for a rise into IndyCar. 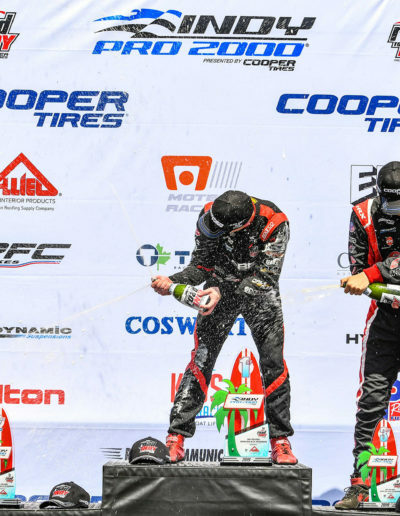 ST. PETERSBURG, Fla. – Parker Thompson and Abel Motorsports ensured a virtually perfect commencement to their fresh partnership as the gifted Canadian led from start to finish in today’s Grand Prix of St. Petersburg Presented by Allied Building Products. 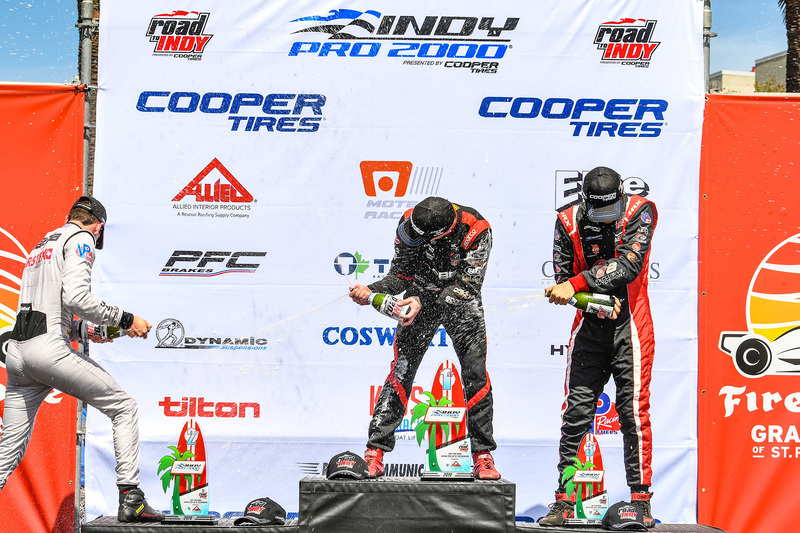 Thompson, who celebrated his 21st birthday just one week ago, backed up his victory in yesterday’s opening round of the Indy Pro 2000 Championship Presented by Cooper Tires by posting the fastest time in qualifying earlier this morning. The native of Red Deer, Alb., Canada, then catapulted immediately into a lead he never looked likely to relinquish. 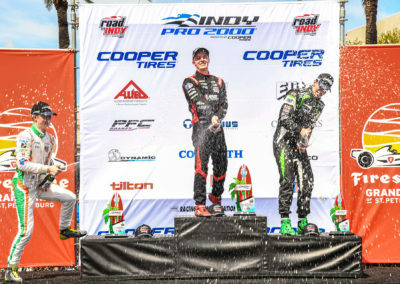 Kyle Kirkwood, from Jupiter, Fla., who won last year’s Cooper Tires USF2000 Championship, the first step on the unique Road to Indy Presented by Cooper Tires open-wheel development ladder, bounced back from a disappointing result on Friday to finish second for RP Motorsport USA. Danial Frost, from Singapore, overcame a two-position grid penalty to complete the podium for Exclusive Autosport. After being jumped on the start yesterday, Thompson this time made an exemplary getaway to lead outside front row qualifier Kirkwood into Turn One on the first of 30 laps. Behind, Frost made amends for being assessed a two-grid-positions penalty this morning after failing to acknowledge the checkered flag at the end of qualifying by vaulting from sixth on the grid to third ahead of Juncos Racing teammates Sting Ray Robb, from Payette, Idaho, and Rasmus Lindh, from Gothenburg, Sweden. Moises de la Vara, from Guadalajara, Mexico slotted into sixth for DEForce Racing ahead of Los Angeles, Calif.-based Russian Nikita Lastochkin (Exclusive Autosport). Thompson turned a string of quick laps in the early stages to extend his advantage over Kirkwood to a hair under two seconds at the end of Lap Eight. The margin grew as high as three seconds with two-thirds of the race completed, whereupon Kirkwood found some extra pace and whittled the deficit to just 1.4334 seconds at the checkered flag. Kirkwood also “stole” an additional championship point from under Thompson’s nose by posting a new fastest race lap on the 29th and penultimate lap. 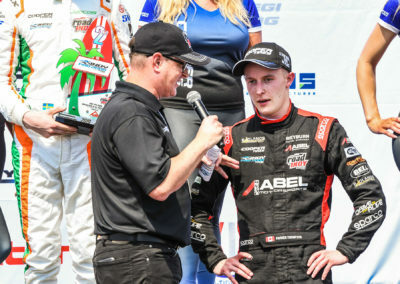 After picking up Abel Motorsports’ second PFC Award of the weekend for the winning car owner, Thompson holds an early 19-point lead, 64-45 over Lindh in the quest for a scholarship valued at nearly $600,000 to graduate into Indy Lights Presented by Cooper Tires, the top step of the Road to Indy, in 2020. Up next are two more races at the Indianapolis Motor Speedway road course on May 10-11. The next races of the 2019 Indy Pro 2000 season take place on May 10th & 11th at the Indianapolis road course. 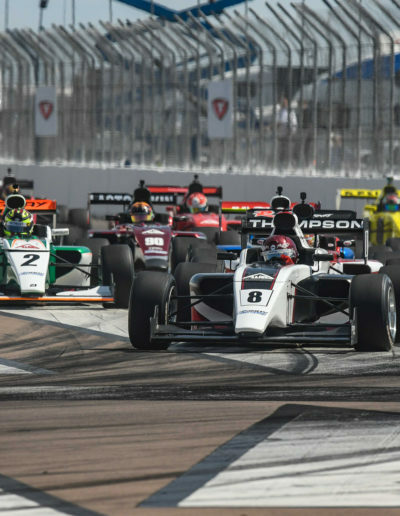 ST. PETERSBURG, Fla. – Two weeks ago, Road to Indy Presented by Cooper Tires veteran Parker Thompson wasn’t even sure he would be on the grid this season. How quickly things can change. 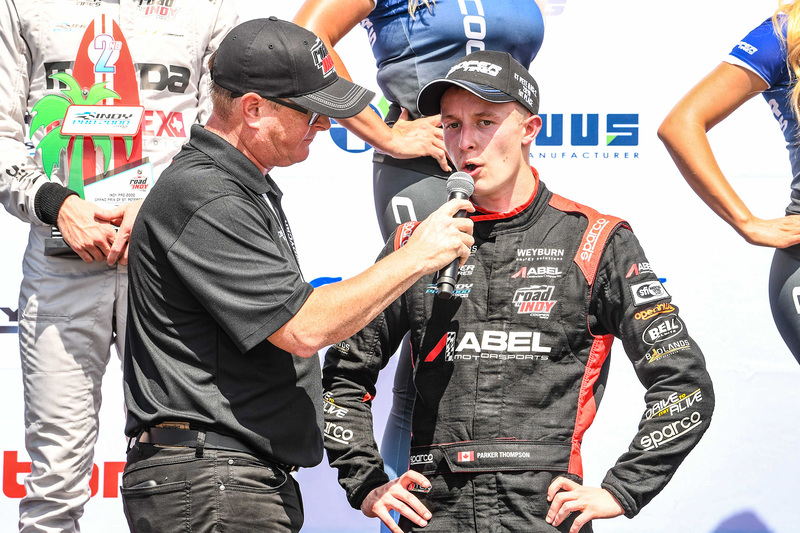 After concluding a late deal to join debutant team Abel Motorsports, Thompson, from Red Deer, Alb., Canada, came from behind to take the checkered flag comfortably clear of impressive rookie Rasmus Lindh (Juncos Racing). Lindh’s teammate, Sting Ray Robb, from Payette, Idaho, matched his career-best finish in third. Unlike the earlier Cooper Tires USF2000 Championship curtain-raiser, the start for this afternoon’s opening round of the newly rebranded Indy Pro 2000 Championship Presented by Cooper Tires was relatively clean. Thompson, mindful of the notoriously problematic Turn One, elected to take a conservative approach which allowed an opportunist Lindh, who qualified second, to drive around the outside and assume the lead at Turn Two. Robb, who started fourth, also snuck past last year’s USF2000 champion, Kyle Kirkwood (RP Motorsport USA) in the opening sequence of turns, whereupon Kirkwood’s attempt to regain third place in Turn Five resulted in contact between the pair and a broken front wing for Kirkwood. 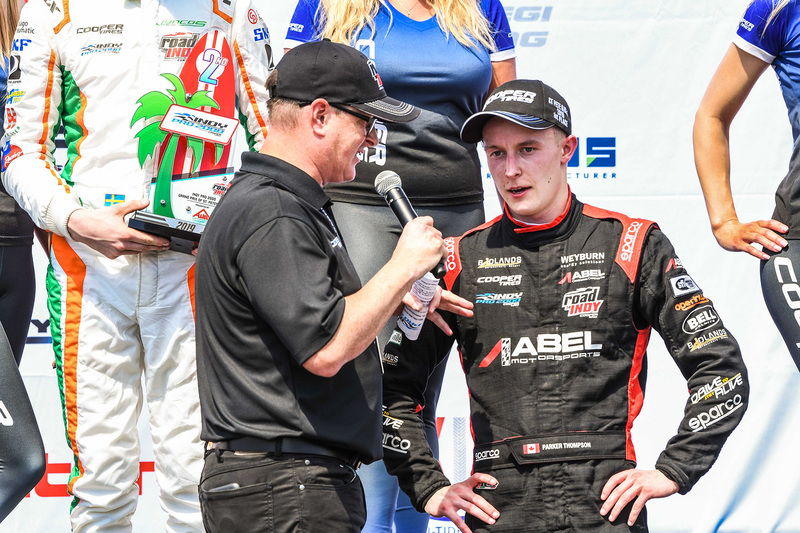 Lindh, who finished second in last year’s USF2000 Championship, also as a rookie, put his head down on the opening lap to open up over two seconds on the field, but it didn’t take Thompson long to reduce that deficit to just a few car lengths. Robb, too, followed in Thompson’s wheel tracks such that the three leaders were back in nose-to-tail formation as they completed the fifth of 25 laps. Their battle was then interrupted by the first of two full-course cautions. Kirkwood’s troubled Indy Pro 2000 debut had ended prematurely in Turn Three after he had slid almost to the back of the field and then made additional contact with Locke (Exclusive Autosport), who was fortunately able to continue unscathed. Lindh picked up from where he left off at the restart. So, too, did Thompson, who, on Lap 15, used his superior traction out of the final corner to gain a run on race leader Lindh, then take the lead in style under braking for Turn One. 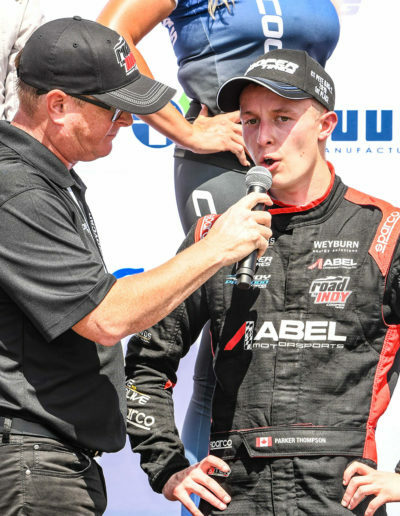 Red Deer, AB – The 2019 Road To Indy season kicks off in St. Petersburg, Florida this weekend, and Parker Thompson will drive for Abel Motorsports in the Indy Pro 2000 category. With a decade of experience in open wheel racing, the Abel Motorsports team is making its first foray into the series. Lead by Bill Abel, the team has demonstrated a high level of professionalism, with the consistency and pace necessary to win championships. 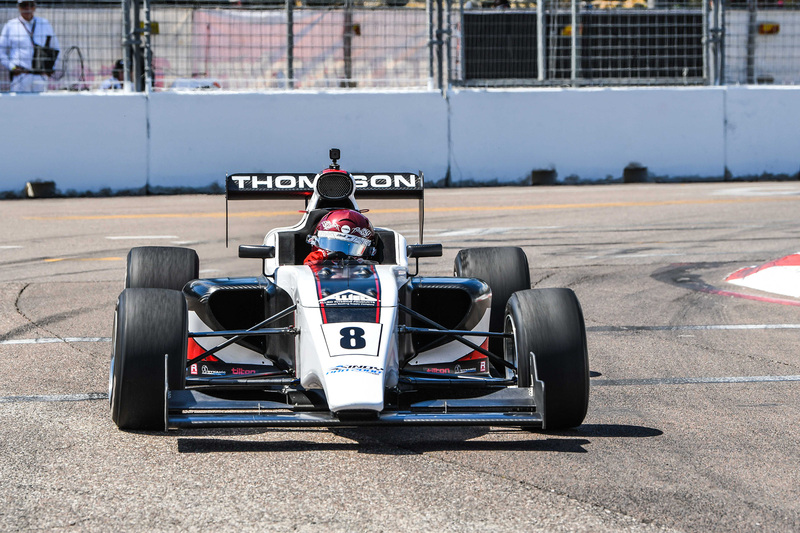 Thompson is coming off his rookie season in Indy Pro 2000 where he finished second in the championship race accumulating three wins and six podium finishes. 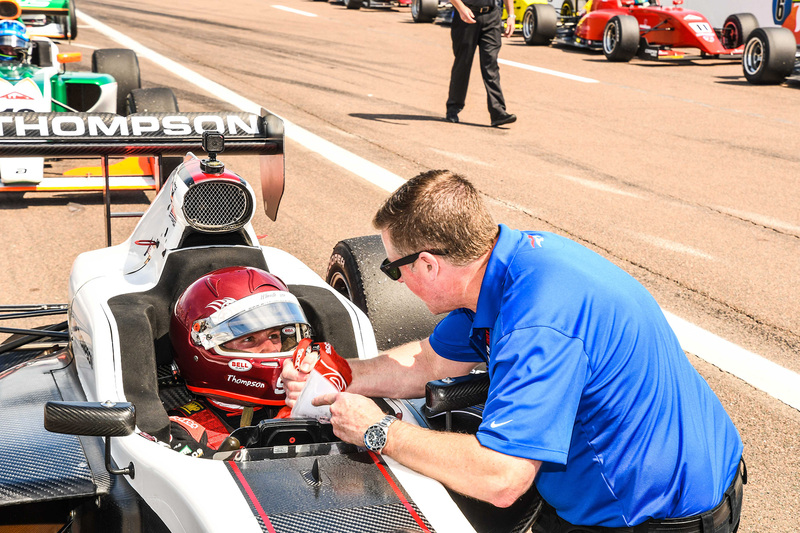 Thompson joined Abel Motorsports for an official Indy Pro 2000 test in Homestead, Florida early in March. This opportunity to work together revealed great chemistry between Thompson and the Abel Motorsports crew, as well as promising pace for the coming season. As a result, Thompson will pilot the #8 IP2000 Abel Motorsports car alongside talented rookie teammate, Jacob Abel, this weekend at the Grand Prix of St. Petersburg. Practice and qualifying for the opener are Thursday, March 7th, with Round 1 of the Indy Pro 2000 Championship taking place Friday afternoon, March 8, at 12:40 PM EST.